The popularity of PRP treatments among patients for aesthetic purposes has exploded as patients realize the long term natural and permanent benefits. PRP is blood plasma that has been enriched with platelets and contains several different growth factors and other cytokines that can stimulate healing. One of the more exciting uses of Platelet Rich Plasma (PRP) injections is it’s extended use for alopecia (hair loss in men and women) treatments in patients. It’s a procedure in which platelet rich plasma is drawn from your own blood to be used for medical treatments such as nerve damage, bone repair, regeneration and cosmetic procedures. By injecting into the skin, PRP is useful in cell restoration and in speeding up the healing process. The result is youthful, rejuvenated skin. PRP skin rejuvenation is commonly applied to the face, neck, chest and hands. Wrinkles, photo damage and discoloration can be treated by PRP injections. It depends on the amount of hair loss that has occurred and the health of the follicles. Each patient is different and will have different results. Some patients will require follow up treatments(s). Does PRP help me with frontal hair thinning? 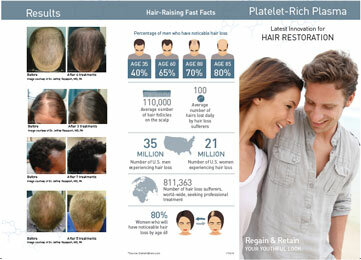 As long as there are hair follicles still existing, then PRP can be effective at regenerating them. Are PRP treatments beneficial in male/female pattern alopecia? If the alopecia is caused by autoimmune most likely not. It might slow down the process. If it is not caused by an autoimmune process it most likely will help regenerate hair.